I would like to congratulate you on your various programmers on the drought and especially the human spirit of the farmers trying to survive the drought, they are extremely moving. I am running an endangered species project involving saving the tiger in the district of Philippolis, so I am surrounded by sheep farmers. The drought has been severe in the Philippolis area and several farmers are facing bankruptcy. However there is a potential story which you have overlooked. If you go back to the 1820 Settlers trekking inland in their wagons, these pioneers would have encountered a landscape littered with millions and millions of wild animals. Into this garden of Eden came the farmer with his sheep, goats, cows and horses. Because the wild animals competed with his domestic stock for grass, he shot them. Once the farmers had destroyed the wildlife they set about owning the land. In short they fenced off their farms, destroying the very thing that had made the ecosystem great in the first place, the mobility of the animals. Today the wire fences in the Karoo could wrap around the earth several times. Droughts are nothing new, they are nature’s way of culling the weak the sick and the old from the great herds. However in droughts, the wild animals simply moved away from the drought areas to the areas where it had rained. To areas where there was grass. The farmer goes contrary to nature. He does not allow his domestic stock to move. He maintains them on his farm for 12 months of the year. Because his domestic stock have to drink daily, he drills boreholes and constructs windmills to pump the water out. Everyday the domestic stock trample in to the water point, destroying the grass cover, exposing the land to trench erosion. Now what water falls, is lost down the gulley and is lost to the system. The whole process is called deserfication, an ugly word for an ugly process. The drought moves in. The isolated thunderstorms miss the farm. The farmer is overstocked, the grazing is finished, the market prices are down (because all farmers are in the same boat.) He tries to sell off stock but there is no market. The farmer prays for rain but no rain comes. Effectively the farmer is trapped in a situation where there is no way out. Bankruptcy stares him in the face. In short his father or his grandfather have disobeyed the laws of nature and now he is paying the price. If a Martian were to land on the farmers farm, he would wonder at the wisdom of destroying 300 million wild animals perfectly adapted to African conditions and replacing them with 9 million exotic animals, not adapted to the conditions and parasites of Africa. The Martian would wonder how ignorant to take away from the animals the very thing that made them successful, their mobility. What the Martian does not understand is the mentality of the farmer. The farmer hates anything he cannot control. 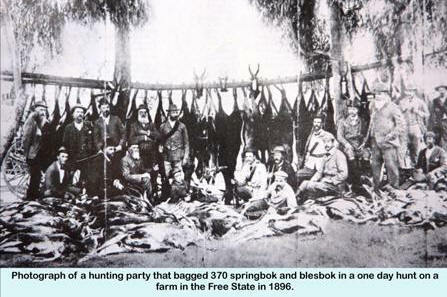 Therefore herds of migrating springbuck are a no, no! The farmer wants animals that he can contain, manipulate, subjugate and control. Nothing and nobody can compete with the farmer. Therefore jackals, caracals, baboons and even bushmen are destroyed on sight. Lions, leopards, cheetah and hyenas were killed a long time ago! 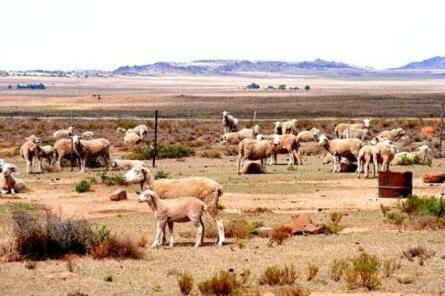 Most South African children think that the indigenous animals in the great Karoo are sheep, goats, horses and cows. A good Carte Blanche program could enlighten them. Indeed it could enlighten us all. "And lastly, I just want to say this: Making The Revenant was about man's relationship to the natural world. A world that we collectively felt in 2015 as the hottest year in recorded history. Our production needed to move to the southern tip of this planet just to be able to find snow. Climate change is real, it is happening right now. It is the most urgent threat facing our entire species, and we need to work collectively together and stop procrastinating. We need to support leaders around the world who do not speak for the big polluters, but who speak for all of humanity, for the indigenous people of the world, for the billions and billions of underprivileged people out there who would be most affected by this. For our children’s children, and for those people out there whose voices have been drowned out by the politics of greed. I thank you all for this amazing award tonight. Let us not take this planet for granted. I do not take tonight for granted. Thank you so very much." The lodge in the canyon is nearing completion. 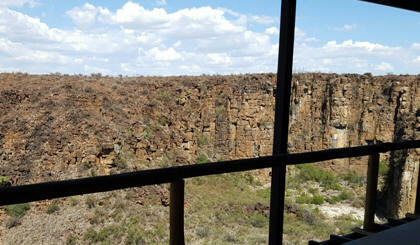 Two luxury rooms with bathroom en- suite combine with a spacious lounge over the spectacular Tiger Canyon. A private creative room with state of the art downloading facilities for photographers is adjacent to the bedrooms. In front of the lodge, a small waterfall and swimming pool for tigers, has been created. I was determined to make the lodge environmentally friendly, not dependant on burning fossil fuels. To achieve this, it took the cost over the budget by R1 million. However, in 7 years time, the saving from not burning fossil fuels, breaks even with the initial cost of the solar energy. I would like to thank Margaret Pang who is the main financier of the lodge for her incredible generosity and support at all times. In addition, Jos and Yvette van Bommel, Emma Wypkema, Rodney and Lorna Drew for giving me excellent advice. To the builders Ian Stark, Jan Kruizenga and Bennie, my sincere thanks. My thanks to Sheldon Nyce for costing the solar component. My thanks to Daryl and Sharna Balfour for producing the book "Simply Safari". This became my bible during construction of the lodge. Some 5 years ago, I set myself a target of converting the entire Tiger Canyons fleet to electrical motor vehicles. In this project, I have failed dismally! There is not a single motor car manufacturer in South Africa that produces an environmentally friendly motor car. Only Toyota produces a hybrid and they are few and far between. If we the consumer doesn't demand environmentally friendly cars, there is no incentive for the car manufacturer to make them. I urge everyone to move their houses, cars and lifestyles to a lighter footprint on the planet. The South Africa Government is to be congratulated for creating the first solar powered airport in the world outside the city of George. We the public should embrace this achievement and push for legislation in the direction of electrical cars. If we save the tiger from extinction, but at the same time we are burning fossil fuels, are we really achieving anything at all? The planet experienced the hottest year in recorded history. The drought around Tiger Canyons was crippling. Climate change is here to stay. Congratulations on winning your recent Oscar and especially your acceptance speech. Your presentation to the United Nations was powerful and accurate. I hope that some ears in the room heard your words. The various organization that your Foundation has donated to, are worthy causes. I thank you on their behalf and the wild animals they represent. For sixteen years I have founded and run an ex-situ conservation project in South Africa to save the endangered tiger. The project is run on Tiger Canyons (www.jvbigcats.co.za) and presently supports the only wild population of tigers outside Asia. The area converted from sheep farms to wild life is 65,000 hectares. Two films “Living with Tigers” and “Tiger Man of Africa” have run for many years on Discovery Channel and National Geographic Wild respectively. For the first time in sixteen years, some money has gone into building a 4 bed lodge on a dramatic canyon. The lodge is called “The Tigress Julie Lodge” after my founding Tigress. On the 28th of May 2016 we will open the lodge in a moving ceremony and a tribute to wild tigers. I would be most honored if you could attend the opening of the lodge.